My opinion, as a batter, is that the only time you change your line of running is when there’s a run-out opportunity. If the ball hits you when it would have hit the stumps, you can be given out [obstructing the field]. Are they trying to rough the pitch up? I’d like to think it’s down to naivety. 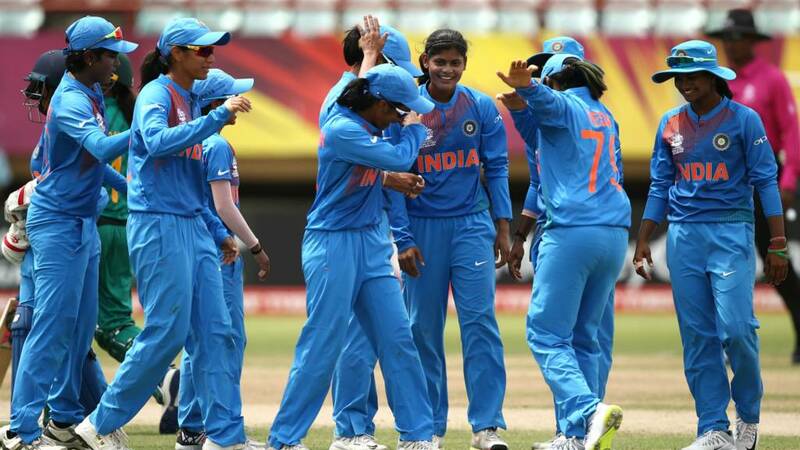 Thanks, Jamie – India’s openers are striding out to begin their innings, and the unmistakeable wide-brimmed hat of the experienced Mithali Raj is one of them. She wasn’t needed to bat the other day, but the former skipper is going in at the top of the order with Smriti Mandhana. So, as we’ve been saying, India will start at 10-0 after 0.0 overs. India with a target of 134, but they have already accrued 10 penalty runs remember so it is effectively 124. Much to get through then, but at least the sun is still shining and here is Mark Mitchener to describe the remainder of the contest. And here’s how it ended for Nida Dar – passing 50 with a six and then holing out in the deep next ball. The small figure of Pakistan captain Javeria is being told the reasons for her team’s 10-run penalty in no uncertain terms by umpire Sue Redfern. It is pretty clear really, they were running straight down the middle or the pitch, and given there is Australia-Ireland to come on the same surface this evening, the umpires are merely enforcing the correct laws. Let’s be honest, there’s still a big gap between Pakistan and India at this level. But Pakistan have given themselves an opportunity here to maybe upset the odds. A scrambled single for Pakistan is cleared by TV umpire Polosak but the imposing figure of umpire Redfern places a hand across her chest again and it is a second five run penalty for Pakistan. So India, having been set a target of 134, will start on 10-0. Another stumping and it’s two in three balls for Poonam. The final over is bowled by Poonam who is hoisted down the ground for four by Aliya Riaz. Pakistan just need to make sure they rotate the strike in this last over. That can make the difference between 135 and 140, they don’t want to chew up any dot balls. Two new batters at the crease now and three successive dot balls as they cannot get Hemalatha away. That was definitely the right option, but Dar just couldn’t get underneath it and get the elevation to clear extra cover. Dar reached her fifty in style with a six after the fielder took it when stepping on the rope, but she departs next ball, caught in the covers. That will be a big relief for India, and for Krishnamurthy after shelling a simple chance earlier. The fielders look deflated, they will need to get some momentum into their batting innings. Finally a catch is taken! Having put one down in the same long-off spot, Krishnamurthy makes no mistake this time.